As part of our mission to promote authors, the joy of reading, and to better understand the craft of writing, we’ve paired with the The Norwich Bookstore in Norwich, Vermont to present an ongoing series entitled “3 Questions”. In it, we pose three questions to authors with upcoming visits to the bookstore. Their responses are posted on The Book Jam during the days leading up to their engagement. Our hope is that this exchange will offer insight into their work and will encourage readers to attend these special author events and read their books. This post features Marianne Szegedy-Maszak author of I Kiss Your Hands: Hearts, Souls, and Wars in Hungary, her first book. 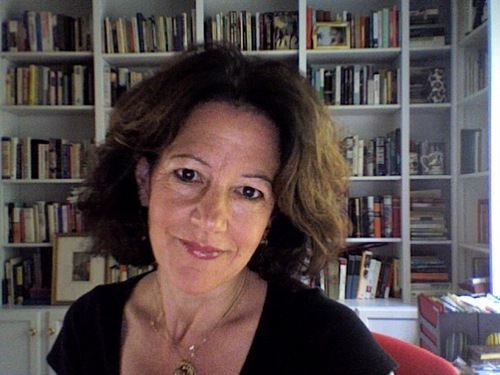 Ms. Szegedy-Maszak’s journalism career has spanned over twenty-five years and has included covering the collapse of communism, the Republican Revolution, 9/11 and social policy for the New York Times Magazine, Esquire, Harpers Bazaar, and many more. Ms. Szegedy-Maszak will appear at the Norwich Bookstore at 7 pm on Wednesday, April 9th to discuss her work. Reservations are recommended. Call 802-649-1114 or email info@norwichbookstore.com to reserve your seat. Always difficult to narrow things down to threes, when there is such a rich and wonderful collection of influences. One of the first and most influential books for me was Nixon Agonistes by Garry Wills. It was a book that grew out of his brilliant coverage in Esquire of Nixon’s campaign and I was a senior in high school when I read it and at that moment knew I wanted to be a journalist. The depth of insight, the richness of his writing, and the way he brought his formidable intellect to bear on covering this tragic president– before Watergate– was astonishing. I remember reading Speak Memory by Nabokov, a memoir of his life in Czarist Russia right at the twilight of an era, with a little notebook and every once in a while I would just copy a sentence or a phrase. The details and the fluidity of memory that he captured by focusing on the most minute, superficially trivial details taught me that in memoir, it is so often about the trees, not the forest. My Antonia by Willa Cather is a book that always brings a little lump in my throat when I think about it. Cather wrote with such astonishing simplicity in the voice of a young man, a slightly unreliable narrator, who nonetheless kept me suspended between his internal life and the world all around him. She had such total confidence as a writer, every word rings true, nothing is extraneous from physical to emotional details. After the more rococo prose of Wills and Nabokov, Cather is the cool drink of water. I struggled to avoid being a Rebecca Mead copy-cat, but unfortunately I have to admit, that I would love to have a cup of coffee (or perhaps tea, or perhaps a good strong drink) with Mary Ann Evans, also known as George Eliot. I loved Middlemarch, of course, always preferred her to Jane Austen (whose charms, I fear, elude me), but it is not just because Eliot is such a brilliant writer, or because she is so deftly political, but because she could be such an expert guide to a life lived both conventionally and very much on the margins. Today’s post features Susan Conley, author of Paris Was the Place, an Indie Next Pick, and an Elle Magazine Readers Prize Pick. An American novelist, nonfiction writer, poet and creative writing professor, Ms. Conley’s memoir, The Foremost Good Fortune, was excerpted in the New York Times Magazine and the Daily Beast. Ms. Conley has received fellowships from the MacDowell Colony, the Breadloaf Writers Conference, and the Massachusetts Arts Council. She currently teaches at the University of Southern Maine’s Stonecoast MFA Program, and at the University of Massachusetts at Lowell. Susan is co-founder of The Telling Room, a nonprofit creative writing lab in Portland, Maine. Ms. Conley speaks at the Norwich Bookstore next week on Wednesday, September 18th at 7 pm. Reservations are recommended, please call 802-649-1114 or e-mail info@norwichbookstore.com for more information or to make a reservation. While we have not yet read her book, we enjoyed her answers to our questions below. We especially like her eclectic list of books on her bedside table as it includes many of our favorite authors such as Jane Gardam, Halldor Laxness and David Sedaris. We also truly hope she manages to finish Independent People by Laxness; we both loved that novel! Joan Didion’s The White Album taught me that women could write about the same things that men could: rock and roll and politics and driving cars on the Santa Monica freeway. But that women could do something perhaps more interesting–they could layer on to that social inquiry a more internal, emotive investigation of what it means to be a mother or a sister or a daughter or a wife. Didion opened up the world of complex, nuanced, startling intimate creative non-fiction to me. Her novels are also lessons in compression and distillation and I have devoured all of those too. Tolstoy’s War and Peace taught me about breadth and scope and the infinite possibilities of how to write about family. You may be able to tell I preferred the domestic chapters to the war chapters, but those battle scenes and schemes were extremely educational too. This book showed me how to write about the intricacies of place and how to use place as a full-blown character in my work–a portal into the story. This book is also so generous with its treatment of scenes. Tolstoy stays in the scenes for a long, long time. Much longer, in fact, than you think it’s possible to. And this is how he is able to fully render his character, until they come completely alive on the page and work their way into our hearts. Virginia Woolf’s To the Lighthouse is on the list because this was the book that showed me how novels can spend all their time tracing their character’s shifting internal thoughts. Not much happens in this beautiful novel. It’s mostly the mapping of each character’s fluid, discursive inner thinking. Woolf showed me that it is rare that two characters in a novel (or in the world for that matter) are actually speaking to one another–actually exchanging ideas. And that most often they are pushing some kind of unseen and often unconscious agenda in their mind without even knowing it. Often they are lost in their own dreams and their own questions and musings. Then every so often, two people connect, as they do in quiet, powerful moments in To the Lighthouse and there’s great pathos and emotion. Probably the esteemed Virginia Woolf. Because of her prolific career–so many novels and essays and letters and journals. But also because of her layered, complicated life and the crowd she hung out with. Her perch in the famed Bloomsbury art world in England and her famous sister Vanessa would make talking to Virginia even more fascinating. That is, if I could get her to talk. I have a feeling she would be rather circumspect and want to drink her coffee (or tea rather) and then go home.